Precarious work has made a lot of headlines recently, after the Federal Finance Minister suggested that we should just get used to it. For workers dealing with low-wages, contract, and temp jobs with no benefits ”getting used to it” means poverty, stress related diseases and little choice in life. That’s why many workers are speaking out, providing education and talking about the real solutions for decent work. And we need your help in building this movement. 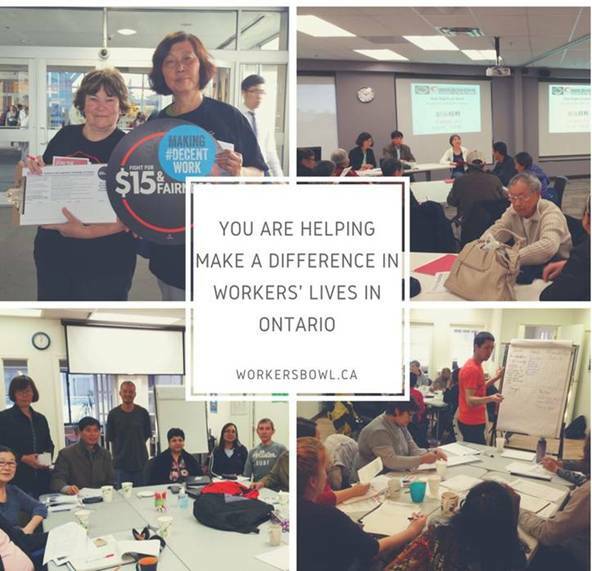 This week the OEERC is hosting its annual Workers’ Bowl fundraiser to support education, leadership and organizing programs at the Workers’ Action Centre. The funds raised help workers struggling with bad jobs become involved as leaders in centre. At WAC, workers not only receive support for problems at work, but also find a community they can be a part of, an opportunity to get access to education and become involved in the labour movement. We need you to make a donation today to continue the OEERC’s Education and Leadership Fund for Workers in Precarious Employment. No contribution is too little or too big! Together, we can change the current belief that bad jobs are here to stay and we can’t do anything about it. Leadership Training programs for workers in precarious work on “how to” organize a workshop on rights in the workplace, community outreach skills and policy engagement. The OEERC — in partnership with WAC — offers a space for workers in precarious and low-wage jobs to deal with violations of rights at work. We reach out to workers through our hotline, ESL classes, employment resource centres, settlement agencies and neighbourhood spaces.